If you run a small business, you know how time consuming bookkeeping can be. Payroll, VAT and keeping track of invoices and payments, can eat into time that would be more productively spent on running the business. As a smaller enterprise, it can be daunting to delve into the world of accountancy software, so there’s a temptation to stick with what you’ve got, even though you know it’s not the most efficient way to do things. But now there’s a far simpler way to manage bookkeeping tasks, using the latest software but without breaking the bank or getting involved in complex software set-up. Firms such as Allsquare can offer cloud-based bookkeeping and accountancy which will hugely improve your business productivity. “Cloud-based” means that your business data is held online, but is available to you whenever you want to access it. You can also use a cloud-based accountancy service, which you subscribe to, instead of buying a software package and installing it on your office PCs. This has a host of advantages. Instead of buying a package and having to pay to upgrade it on a regular basis, you log on to a portal and use the latest release of the software. You don’t have to worry about backing up data – that’s all done for you. And the emphasis is on user-friendliness and simplicity, so there’s no learning curve. Allsquare has a great deal of experience in helping clients from sole traders, to limited companies. The team can set your books up online for you so that you can start profiting straight away from the security, efficiency and flexibility that an online service offers. Many businesses are now mobile, or have employees who work partly from home; some have dispensed with an office altogether. Cloud accounting and bookkeeping allows your business to access financial information from any device that can connect to the internet – mobile, tablet, laptop etc. This can completely change the way you do business, and enables you to run a highly streamlined business model, with smaller premises and more staff working remotely. 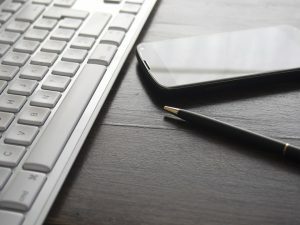 The ability to access your accounts from a mobile device can mean that you don’t have to invest in expensive, space-hogging PCs, with backup requirements and maintenance contracts. It also makes your business more robust. You needn’t worry about flood, fire or building damage making it impossible to run the business. You can run it from anywhere, because your software, data and records are safely held on remote servers and are backed up by the provider. Keeping up to date is much easier. Updates after budget changes, for example, are applied to the software by the provider, so that on the date when a given change takes effect, the software reflects it, and you don’t need to do anything else. A user-friendly accountant, such as Allsquare, can get you up and running on a cloud-based solution, so that you can streamline the way in which you manage the books and start reaping these efficiency benefits as soon as possible.